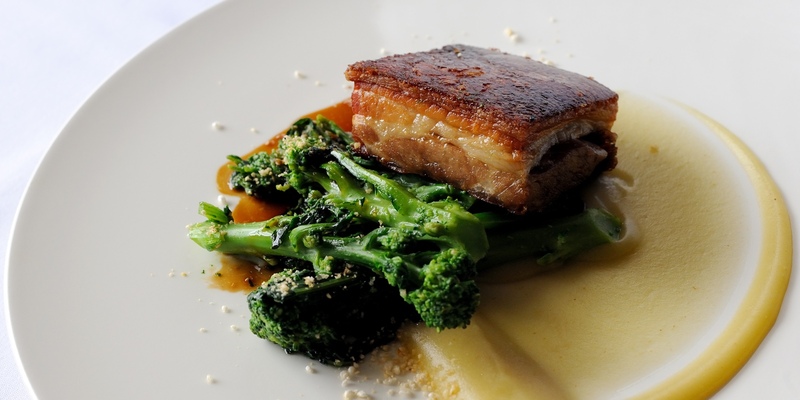 Pork belly is a relatively cheap cut of meat and requires long cooking times in order to achieve succulent results. Pork belly is one of the best meats to cook sous vide as the long time and low temperature prevent the meat from drying out and losing flavour. Brining the pork ensures even seasoning before cooking. Different flavours can be added to the brine according to taste. Wholespices such as cumin, coriander, cinnamon and star anise all work really well and it is a good idea to use a combination of spices for the most flavour. Herbs can be put into the bag when cooking – sage is a fantastic match with pork belly. While not vital, adding oil to the vacuum bag will give a much richer result similar to that of confit – just be sure to use a flavourless oil like sunflower. Luke Holder cooks his pork belly sous vide before charring it on the barbecue for an extra-smoky flavour. Richard Davies keeps it traditional with his Pork, baked apple and crackling recipe and Andy McLeish coats his pork belly in breadcrumbs before deep frying in his Crispy pork belly with black pudding, celeriac remoulade and apple purée.